ADDIS ABABA: Three Ethiopians have been killed in Saudi Arabia when violence broke out between police and illegal immigrants preparing to return home, Ethiopian officials said Tuesday. Each year, large numbers of Ethiopians move to the Middle East looking for jobs, often as domestic workers. Saudi Arabia is among the preferred destinations. “The act of killing innocent civilians is uncalled for, we condemn that,” Foreign Ministry spokesman Dina Mufti told reporters, saying he had been informed of the death of three Ethiopian citizens. Ethiopia announced last week it would repatriate its citizens illegally living in Saudi Arabia after a seven-month amnesty period allowing immigrants to gain legal status expired. Dina said the government has called for an investigation into the deaths and said that a delegation has been sent to Saudi Arabia to help the repatriation process. “We have asked also for an investigation into the killings,” he said, adding that Addis Ababa had dispatched a team to Saudi Arabia to take care of Ethiopians there, and either register them or bring them home. Around 200,000 women sought work abroad in 2012, according to Ethiopia’s Ministry of Labour and Social Affairs. Read more at the Daily Star Lebanon News. Ethiopians gather in Manfouha, southern Riyadh, Saudi Arabia as they wait to be repatriated on Sunday, a day after rioting that followed a visa crackdown by Saudi authorities. (Reuters). 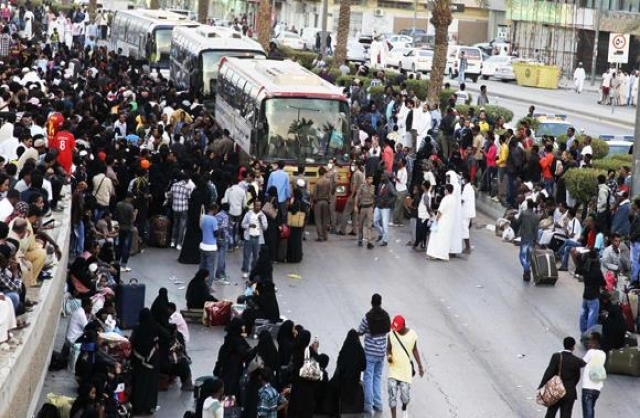 RIYADH: Thousands of mostly African workers gathered in Riyadh on Sunday seeking repatriation after two people were killed in overnight rioting that followed a visa crackdown by Saudi authorities. One of those killed was a Saudi, said a government statement, and the other was not identified. An Ethiopian man was killed in a visa raid last week. Ethiopia’s foreign minister condemned the deaths, and told Reuters his government was working to bring its citizens home. “This is unacceptable. We call on the Saudi government to investigate this issue seriously. We are also happy to take our citizens, who should be treated with dignity while they are there,” Foreign Affairs Minister Tedros Adhanom said. He said Addis Ababa had formally complained to Riyadh and that embassy staff were working to help Ethiopians return home. Hundreds of foreign workers clashed with police on Saturday night and into Sunday in Manfouha, a poor district of southern Riyadh where many low-income expatriates live. Saudi authorities said 68 were also wounded, including 20 Saudis. More than 500 were detained and over 100 cars torched. The Saudis said earlier this year they would no longer tolerate visa irregularities which have led to a large black market in cheap foreign labor in the world’s top oil exporter. Government raids on businesses, markets and homes began last week after a seven-month amnesty for foreigners to correct their visas or leave without paying penalties for overstaying or breaking other rules, ended on Nov. 4. In Manfouha, a long line of buses slowly filled up, as Africans arrived from neighboring streets, alone or in groups, and carrying bags. One man walked with his little daughter, while women carried babies, Reuters witnesses said. Groups of people in Arab and south Asian dress stood on rooftops to watch. While the scene unfolded peacefully, many police stood nearby and several ambulances were also present. “No iqama (residence permit),” said one man who said he was seeking repatriation to Ethiopia. He said he had arrived in Saudi Arabia illegally a year ago after paying smugglers 5,000 Saudi riyals ($1,333) to make the dangerous trip over the Strait of Hormuz and overland through Yemen. “There’s no money at home. Nothing at home,” he said, pulling a suitcase on wheels. Saudi authorities hope to open up private sector jobs to their own citizens by sending illegal workers home. Hundreds of thousands have left in recent months, but several million have corrected their visas and will remain in Saudi Arabia. Many say they could not take advantage of the amnesty due to bureaucratic problems or disputes with their original employers. On Saturday the Labour Ministry announced it would continue to allow foreign workers to rectify their visas, but only if they paid fines for previous breaches of regulations. More than 9 million of Saudi Arabia’s 28 million inhabitants are foreigners. While many of those targeted in the crackdown entered the country legally but later broke the terms of their residence permits by changing jobs, many others were smuggled across the border or came as pilgrims and did not return home.